Now offering After School Rock Band, Private Lessons and Small Group Lessons!! Students are placed in bands based on age and experience level. Students attend 50-minute a week classes where they work together to create an original song during the 10-week session. Each band has a band coach who serves as a instructor and mentor throughout the session. Student showcases occur at the end of each session. For Girls ages 7-18. * For girls who have never played their instrument before, they must enroll in a small group private lesson in addition to Rock Band. GRSB’s Small Group Class offerings currently include: Guitar, Piano, Drums, Bass, Ukulele, Vocal, Pop Acapella Choir, Music Theory, and Family Music. Each class is 50 minutes long, meets once a week, and most have a max enrollment of approximately 6 students depending on the class. For Girls ages 4-18. 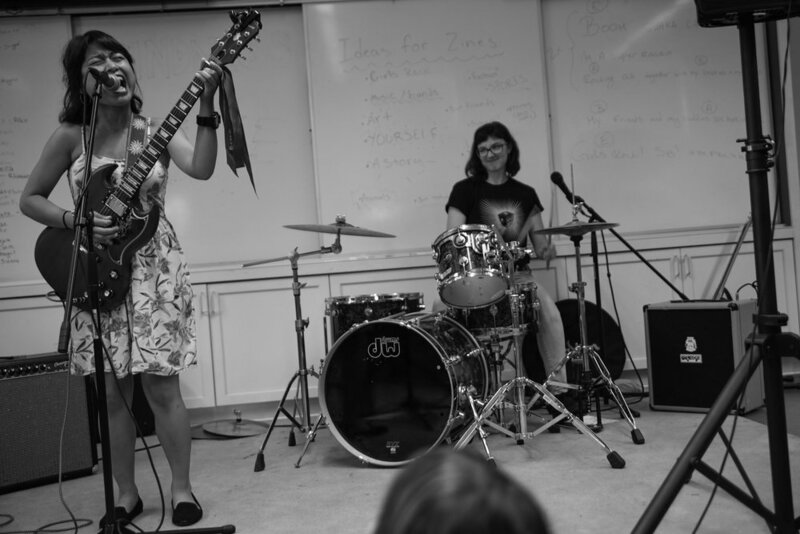 Girls Rock offers private lessons in Drums, Guitar, Bass, Vocals, Piano and Ukulele. Both 30 minute and 60 minute lessons are available. Click below. You will be prompted to note your preferred lesson times during registration. Once your registration has been completed, it will be placed in a queue; a Girls Rock SB staff member will be in touch to confirm your lesson day, time, and instructor as soon as it has been reviewed. For Girls ages 4-18. Get immersed in the art and craft of digital photography and film making. Utilize the tools necessary to capture great images and refine them through digital imaging. For Girls ages 10-17. What Class Should I Enroll My Daughter In? Customize a class to fit your schedule. Have 3 or more people who want to learn something together? You an customize your own class to tailor to your own schedule.